By Dan Horowitz--Toronto’s Beth Torah Congregation, led by senior Rabbi Yossi Sapirman, has something very special on its Rosh Hashanah plate. Reaching out to families as well as to some of Jewish Toronto’s less-affiliated citizens, the shul is offering a two-part community service led by Rabbi Yossi Sapirman. Part one is a Rosh Hashanah service unlike anything you’ve ever attended before, and includes dynamic speakers like Marc Kielburger, co-founder of Free the Children and Me to We, as well as more traditional elements. Part two includes Yom Kippur day family workshops followed by a traditional Ne’ilah service, before moving onto everybody’s favourite, the breaking of the fast. The Me to We family engagement workshop is geared to families with children 7 and older, while the other features a PJ Library workshop led by the shul’s Director of Child and Youth Education, Alley Dezenhouse-Kelner. PJ Library is UJA Federation’s wildly popular Jewish identity initiative which delivers Jewish-themed books and music to the homes of close to 5000 families with children 6 months to 7 years old across the GTA. 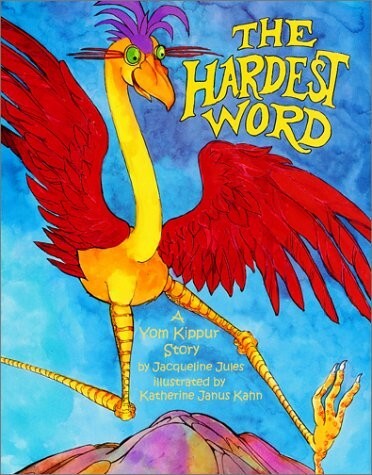 The perfect vehicle to deliver the Yom Kippur message to our community’s youngsters, the PJ Library-based program will centre on “The Hardest Word”, by Jacqueline Jules. The book features The Ziz, a clumsy but good-hearted bird of folklore who is always making mistakes. When he accidentally ruins a children’s vegetable garden, he feels badly and ask God for advice. Though the hardest word for the Ziz to say is “sorry”, he arrives to apologize the next day with his own garden’s bounty to share with the children. Addressing the complexities of saying sorry, the book presents a powerful lesson on forgiveness, and teshuvah – turning around one’s behaviour, or, for Rosh Hashanah / Yom Kippur purposes, atoning for his mistakes and seeking a fresh start. “Our goal for this unique program is twofold,” says Dezenhouse-Kelner. “To engage our youngest kids and their families in meaningful interaction under the framework of Yom Kippur ideas and values, and to build awareness for the PJ brand which is engaging so many young Jewish families in Jewish life. The best part is that we have opened up this service to the community. Non-members can attend if they purchase a ticket, or a community membership, which would give them access to the program for free. PJ Library is programming across the city this fall under a new initiative called “Plug into PJ” which aims to connect young Jewish families to each other, and to the Jewish community in their neighbourhood.